← #Baking4Life Bake Sale Now Open! Dear readers, I hope you’re all having an incredible holiday season so far! As you’re reading this, I’ll be in Hong Kong for a few days with the Husband before heading to Thailand on the 30th (spending 6 days in Phuket then another 6 in Chiang Mai). It’s been a heck of a year. I’ve been largely absent from this beloved space of mine for the past three months and for that I apologize. We bought a house in October and ever since then, it’s been a non-stop grind. We had to clean and prepare our apartment for sale, pack all of our shizz (after it was all said and done, we had about 100 boxes of stuff. How we managed to cram all of that into a 950 square foot apartment is beyond me), move the first week of December, and for the past few weeks, all we’ve been doing is cleaning, living out of boxes (we sold all our furniture with our apartment so we ain’t got nothin’ here) and doing renovations. There are so many bloggers I love ‘n admire who were still killing it on their blogs even in the midst of extreme personal turmoil and change (some of my dear friends come to mind: Paula of Vintage Kitchen Notes who kept blogging through the floods in Buenos Aires, Liz of That Skinny Chick Can Bake who suffered the loss of many good friends and family members, and Alice of Hip Foodie Mom who moved across the country with her kids and husband at the same time her sister was donating a kidney to their mom). How do you ladies do it?! You’re amazing. Just typing that out was exhausting. Anyways, I’ve been a terrible blogger but I swear, once I return from vacay in mid-January, I’ll be back with a vengeance. Until then, I have a few amazing guest posts lined up for you. The first one I’m offering is by the aforementioned Alice of Hip Foodie Mom. I can depend on this lady for anything. As soon as I asked her if she’d be willing to guest post, she immediately said yes, even though this is an incredibly busy time of year for her. She’s a true friend. We were roomies at IFBC, and we’ve guest posted for each other numerous times. She always has my back! If there was ever a baked good that was solely for giving to people to say “I care about you” or “You’re special to me” . . I’d say it was a scone. OK, er maybe muffins. Or a pie? OK whatever, scones are special dammit. I’m Alice and visiting Gotta Get Baked today while Nancy is away on a much needed vacation. Nancy, Tony and Abby have just moved into a house!! I just moved myself so I know what my homegirl is going through right now. . she is living out of boxes and starting some home renovation projects. . only she was brilliant and planned a vacation during the holidays. . a brilliant getaway! And they are not just doing a quick trip. They are going to Hong Kong and then Thailand!! So, in honor of Nancy, I baked these scones today. These are special. If you came from my blog, you read the story here. . I got the recipe from my dear friend, Jen, and now I can’t stop baking these. We have to thank Jen and America’s Test Kitchen. Jen first baked these for me on our road trip to Vancouver. . a little weekend trip we planned just before we moved away from Seattle . . and I was floored these were so good. Like, so good, I devoured two within 10 minutes. Jen baked these for me again right before we left Seattle. The day we left in fact. She packed them up for me to take with me on the plane so I left with a sad heart but my tummy was full with these scrumptious scones. Because these are so delicious and special, I’m baking these for Nancy today. So the next time you want to bake something special, or you’re just getting together with friends to hang out, bake these scones for them and they will be your friends for life. For reals, yo. I hope you enjoy! Note: This recipe is very versatile and you can easily substitute the dried cranberries with other things such as raisins, blueberries or currants. 2. 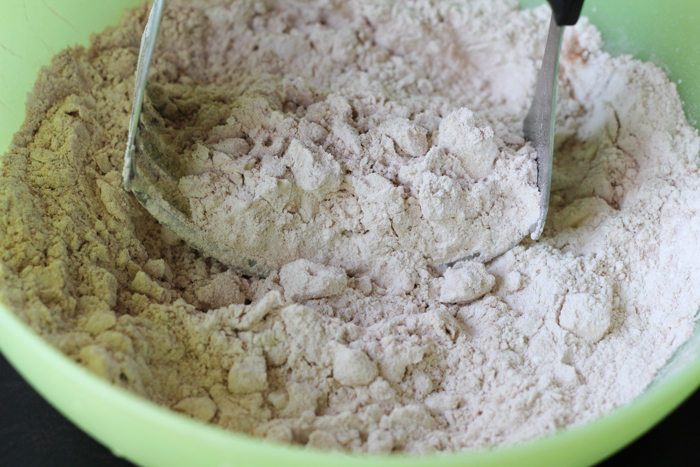 Combine the flour, baking powder, sugar, cinnamon and salt in a large sized mixing bowl. Quickly add the cubed butter and using a pastry cutter, cut in the butter until the mixture resembles coarse sand. Add the dried cranberries and mix together one more time. 3. Using a rubber spatula, stir in the heavy cream until the dough begins to form, about 30 seconds. Transfer the dough and all of the dry flour bits to a lightly floured work surface and knead the dough by hand just until it comes together into a rough, slightly sticky ball, for about 5-10 seconds. 4. Using a rolling pin, gently roll out. Do not roll out too flat (I rolled mine out a little too flat). Using your pastry cutter or a butter knife, cut the dough into 8 wedges (like you are cutting a pizza) and place the wedges on a lined baking sheet (parchment paper or your Silpat non-stick baking mat). 5. Brush each wedge with the egg wash and sprinkle with Turbinado sugar and sliced almonds. Press down on the sliced almonds gently to help them stick. Bake for about 18-20 minutes, (rotating the baking sheet halfway through), or when the tops are light brown. Remove from oven and cool on a wire rack for at least 10-15 minutes. Serve warm or at room temp. 1. The dough will be slightly crumbly. If you have too many dry flour bits not sticking to the dough, you can add just a touch (not more than one teaspoon) of heavy cream, otherwise continue to knead together gently until it all comes together. 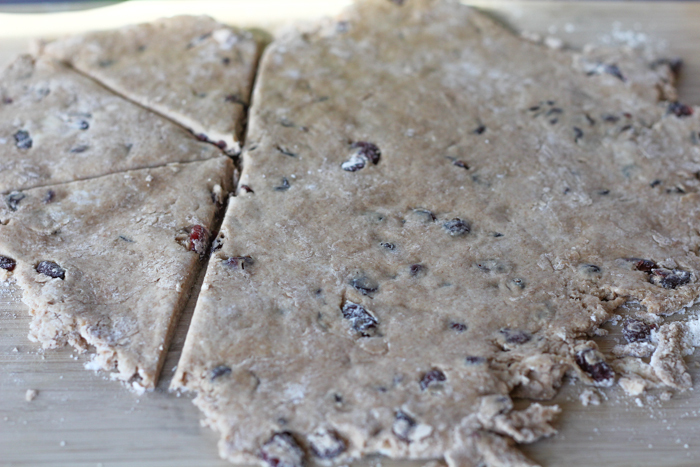 You can press any loose bits into the dough as you go. 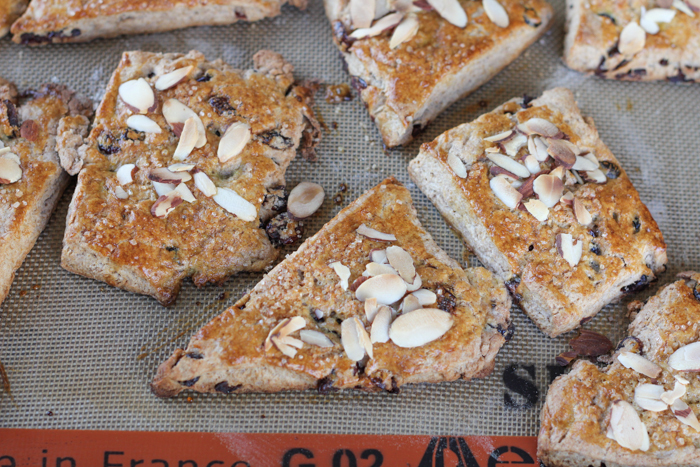 Alice, thank you so much for these glorious, golden, flaky, gorgeous scones! I have two more guest posts coming up for y’all in the next couple of weeks so check back in soon. I just bought the book about a week ago! I can’t wait to start baking from it. Love you two ladies equally. 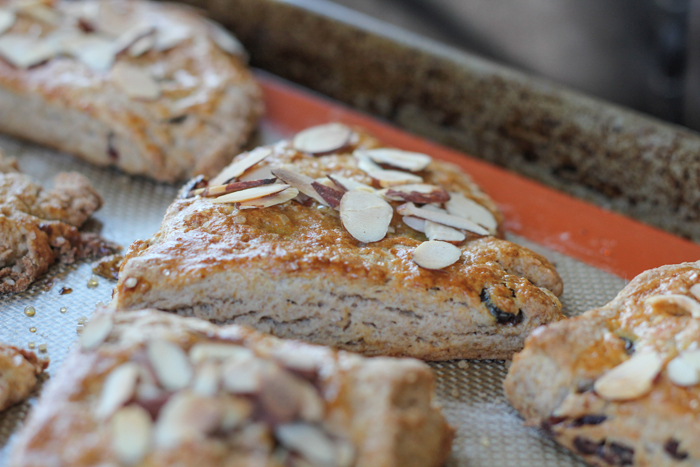 I’ve never attempted a scone recipe but this might get me to try! so thrilled to be here again and I’m so glad you like the scones. . happy travels girl and take lots of photos!!!! so exciting! My sweet friends, how great to find you here together, and sharing scones! 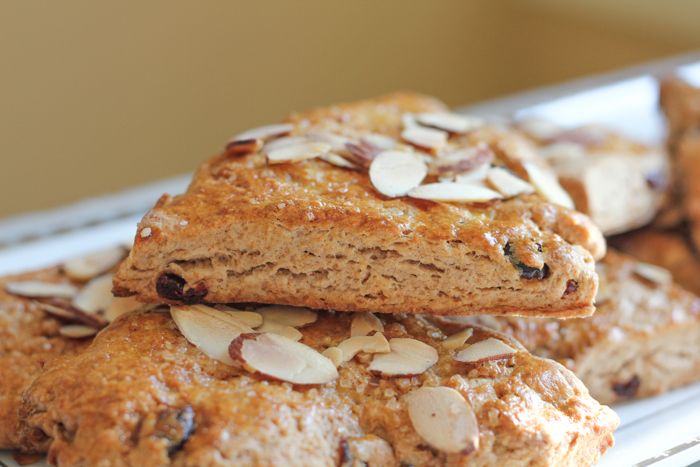 I just love every aspect of baking and eating warm scones, and these sound phenomenal Alice. A trip with these to munch along is the best idea! Nance, I haven’t posted in weeks since I moved, I’ll blame it on my not-yet-installed electric oven, and the reduced space I have now, lol! I need to get back with a vengeance too; too bad I’m not having a vacation before that! Enjoy the New Year celebrations! 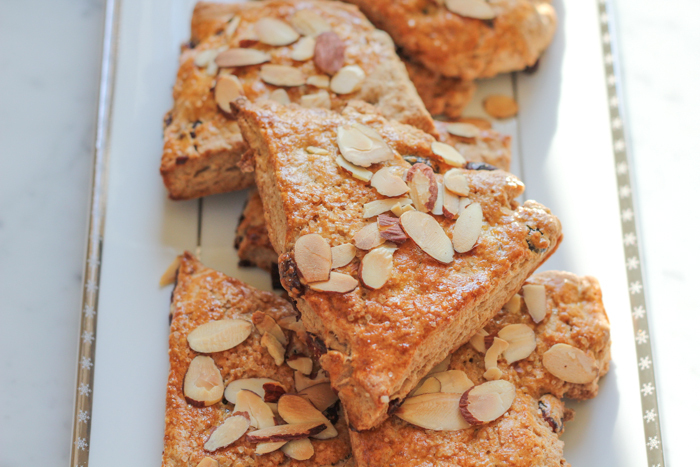 These are amazing scones created by one amazing baker lady for another…As always, Alice your goodies are spectacular! Thank you, Kim! As always, you are the sweetest! Happy New Year! I’m jealous of your fabulous CA weather. . These scones look heavenly, and don’t feel bad about needing to put the blog on the back-burner. We all need a break! Thank you for sharing this fabulous guest post! Scones scones scones, can’t go wrong! These scones look so delicious…absolutely heavenly! Nancy congrats on the new house!! That’s a lot of change and turmoil so that’s totally understandable that you’ve been a little absent lately! I’ll never pass up an excuse to look at Alice’s gorgeous photos 🙂 (I WANT A SCONE NOW.) Hope you are having the most awesome vacation–you deserve it!